Bali Silent Retreat is more than meditation and yoga and being on retreat – it’s a self-sustaining eco-sanctuary with an ashram-like restorative feeling, plus inspirational programs and events, including the most tasty food on the planet. Surrounded by Unesco protected lush rice fields, jungle, healing hot springs and the sacred Mt. Batu Karu, people nourish body & soul and reconnect to true self and inner voice in their own way and own time in profound peace and silence. Practice the ‘Art of Nothing’ and simply ‘Rest, Sleep, Eat and Repeat’ or join daily meditation & yoga asana, walking the labyrinth, soaking in the hot springs, cooling off in the water meditation, or exploring sustainability gardens and medicine plants, or participate in Balinese cultural activities. 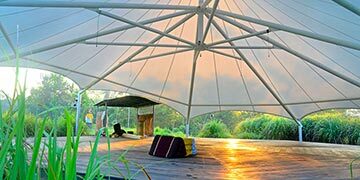 Morning and afternoon are Yoga Asana and Meditation classes in the open air octagon tent (Bale) surrounded by the lush green of nature. Hot Springs and Temple Trips are scheduled daily. Weekly events include talks about Balinese culture and our food philosophy, as well as how to make those cute little offerings. Every new and full moon we perform an Agnihotra healing fire ceremony. On your own you can explore the Labyrinth, Jungle Path, Water Meditation, Library and much more. The Programs Calendar shows all activities included in your Overnight stay and/or Day Pass. 100% cotton linens, down comforters and kimonos – BSR is simplicity combined with luxury. Constructed of recycled timbers, indigenous architectures and local flavor the feeling is simple, warm, earthy, rustic, relaxing and friendly. Room choices include wooden bungalows, snug single rooms or dormitory beds with tasteful touches and stunning views (no air con – it’s cool at night). The Programs are unprecedented and the Food is internationally acclaimed. 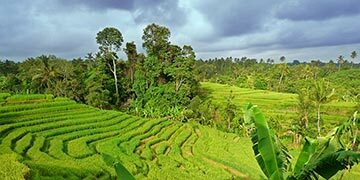 Bali Silent Retreat maintain eco-green-sustainable-off-the-grid standards while supporting the personal spiritual journey of each person in residence. Silent within a wifi-free environment allows a digital detox AND chat-free restful contemplation within a socially supported experience. The meditation and yoga simply support your personal journey. Silent does not always mean quiet! Frogs at night form a joyful chorus, ceremonies in the nearby villages involve music and chanting, and the birds make some of the strangest sounds! Internationally acclaimed! 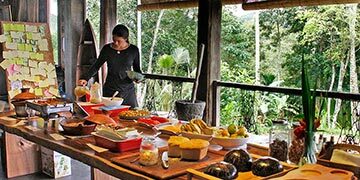 Three organic vegetarian buffets each day and an all-day grazing table (fresh fruits, cookies and herbal teas) our food is always bursting with living energy! (90% vegan) Slow Food certified recipes are prepared by our Garden-to-Table chefs who pour their love and passion into every aspect of food – selecting vegetables fresh from our organic gardens to give you locally sourced and sustainable living food that has been made with love. 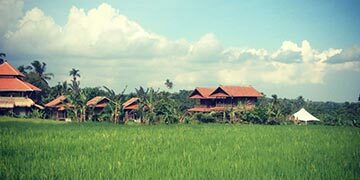 Bali Silent Retreat is located in the Unesco protected rice terraces of the eco friendly regency of Tabanan. 1.5 hours Northwest of Ubud and 2-2.5 North of Denpasar airport by car. The airport is in Denpasar (airport code DPS), the Ngurah Rai airport. Our Transport Coordinator will email you within 24 hours after making your booking, to help with your transport needs. At Bali Silent Retreat we support all aspects of emerging consciousness. Part of our vision and mission is to facilitate the growing awakening of humanity and respect for our planet. (We are all in this together.) Here are links to like minded philosophies, locations, and commitments. Every guest receives a book and pen. 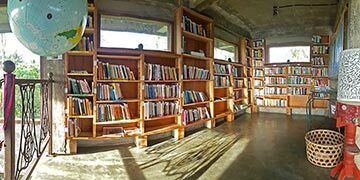 On the outside of the book is written, “For the Ancient Art of Pen Writing.” Often, people experience a spiritual awakening here at Bali Silent Retreat and many say the energy is like heaven on earth. Some of their insights are worthy of sharing here. Bali Silent Retreat is completely and totally sustainably responsible. We take pride in supporting local businesses and the community.